Enthused by the experience of exploring Wagner performances in Germany away from the big, international houses in the anniversary season of 2013 (see review in TWJ, Nov. 2013), I ventured back earlier this year and, by coincidence, alighted upon two of the dramas that share the idea of an outsider transforming the status quo. 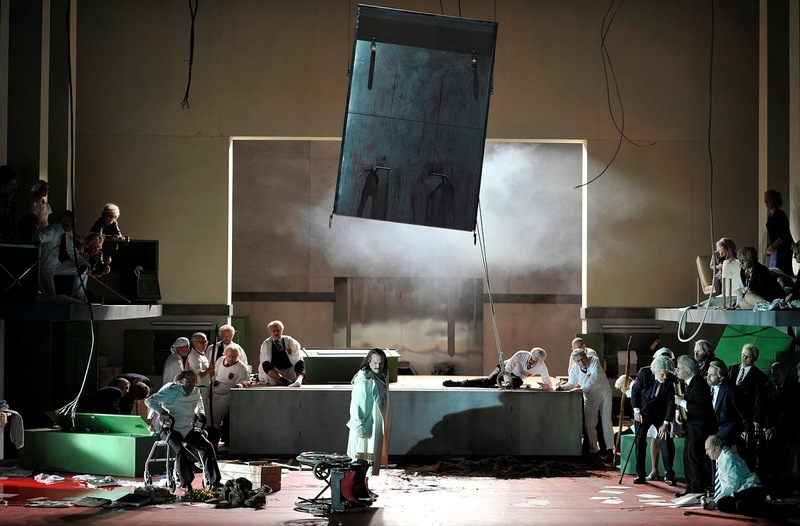 It’s a theme that the directors of both Wuppertal Opera’s Parsifal and Staatstheater Mainz’s Die Meistersinger made central to their concepts, emphasising the role of both Parsifal and Walther as agents of change in deeply conservative, rule-obsessed societies. 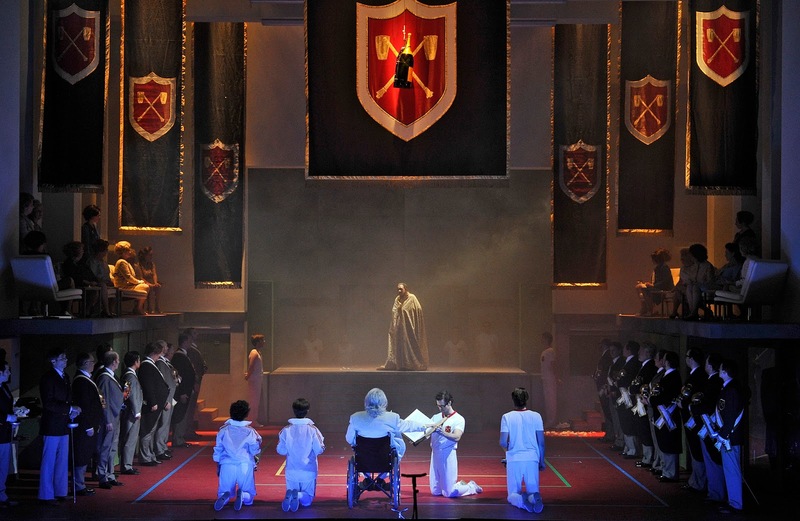 Thilo Reinhardt’s Parsifal, supported by Harald Thor’s meticulous designs, relocates the grail order to an elite sporting academy where Gurnemanz is the track-suited gym master (a neat way of emphasising his lowly position in the eyes of the tail-coated academic masters/knights). That this is an institution that glories in blood-lust becomes clear when Parsifal enters: as part of some arcane hazing ritual, he has shot the school acrobat (the swan) with an archery bow and rather than attend to the wounded athlete, all the students and masters can do is laugh at his misfortune. The Transformation Music takes us to a grand initiation function for the new pupils, who include Parsifal. 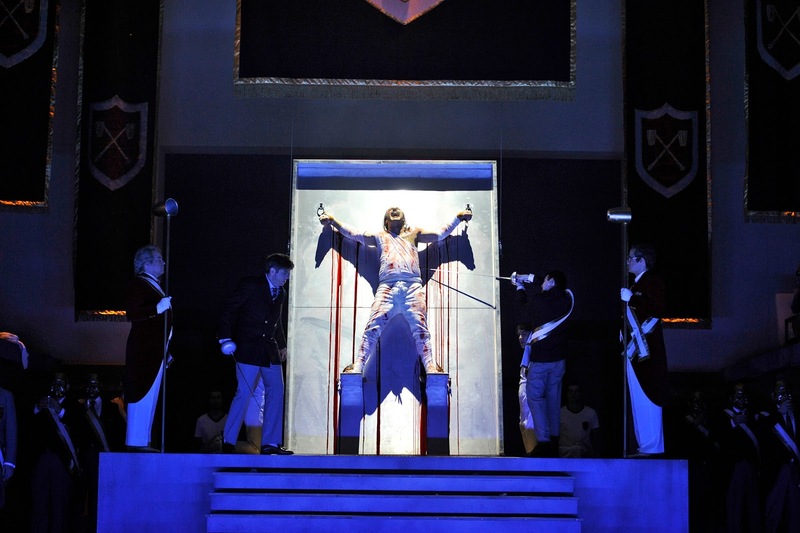 The ‘uncovering of the grail’ – which here seems to be symbolised by a ceremonial cloak – entails a gruesome blood-letting ceremony in which Amfortas is strung up in Christ-like pose and the new recruits have to open up new wounds with their fencing swords before his blood is collected and passed around for consumption among the assembled men. Amfortas’s wounds, plural, it would seem, are inflicted by the community he has dishonoured as revenge for allowing the renegade master Klingsor to steal the spear under his watch. Parsifal’s response to this violence, as appears to be the case at the start of Act II, is to have run amok among his former fellow pupils, who are seen mourned over by the school cheerleading team – the Flowermaidens. His crucial encounter with Kundry is presented as a vision. 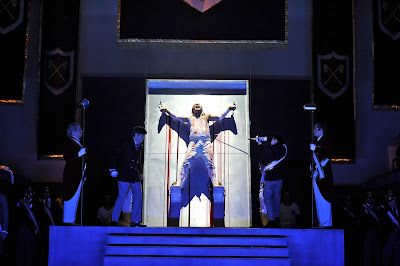 At the kiss, she takes up Amfortas’s crucifixion pose from Act I, which triggers Parsifal’s memory and response. And at the end of the act, as if in a dream, Parsifal deflects Klingsor’s spear by simply covering his eyes and ‘waking’ from the enclosed world of the vision. The curtain opens in Act III on a vision of complete devastation. A grey-haired Parsifal arrives in UN peace-keeping uniform with a posse of war-wounded colleagues. When they demand the uncovering of the grail, Parsifal saves Amfortas from further torture and creates a funeral pyre for the school’s emblematic cloak, spear and old texts. A new order, free from the violence and victimisation of the academy’s former ethos, is welcomed in as the members of the chorus step forward and kneel to greet the closing music coming from the pit, as if to say art and beauty will now transcend evil and provide redemption. Reinhardt’s approach, then, is more than a simple gloss – it has something deep to convey that is in line with if not exactly the same as Wagner’s conception, and it is in the friction between these two visions – and between action and sung text – that greater comprehension can be found. 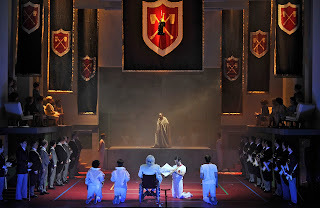 Perhaps its overriding achievement is in the way it conveys Parsifal’s own growth as a person, from a cocky, ignorant youth thrust into a bewildering community to a mature, worldly-wise man whose experience of and participation in the evils of that community transform him into its saviour, the redeemer who is himself redeemed. This characterisation was enhanced by the performance of Tilmann Unger in the title role. This young German tenor has the youth to be convincing as the ‘pure fool’ as well as the maturity as an actor to convey the old soldier and brings a baritonal depth and charismatic, lyrical warmth to every line he sings. His performance stood out, but not at the expense of his colleagues, from the strikingly intense Kundry of Kathrin Göring to Thorsten Grümbel’s determined Gurnemanz and Thomas Gazheli’s torture victim of an Amfortas, all vocally at one with their roles. 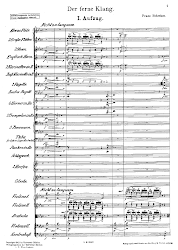 Toshiyuki Kamioka’s conducting, in keeping with modern trends, kept Wagner’s musical tapestry moving yet found the space to delineate its many threads of line and colour. The city of Mainz can lay a certain claim to ownership of Meistersinger: Wagner was staying in neighbouring Wiesbaden while visiting his publisher, Schott, when by his own account a vision of ‘golden’ Mainz’s skyline silhouetted across the Rhine inspired him to begin the Prelude. And in its own way, Mainz’s resident opera company returned the compliment by staging a fresh, witty production, performed with the consummate sense of a company at the peak of its collaborative power. Set in a milieu somewhere between Brave New World and The Wizard of Oz’s Munchkinland, Ronny Jakubaschk’s vision for the work creates a regimented society where green is the only permitted colour, where the Lehrbuben form the floor-mopping drone class, where the Masters are indeed the masters and control every aspect of society and where a machine is the arbiter of artistic rectitude. Into this apparently benevolent dictatorship of the Mastersingers enters the daringly red-headed Walther, and his difference begins to have its effects on this stultifying order: Eva is the first to be enticed, and her bright green hair and clothing gradually take on more red as the evening progresses until by the end Walther’s colour has taken her over completely. The moiré-wheeled machine, doing Beckmesser’s job of marking the young knight’s first attempt at a master song, overheats from the novelty and audacity of his singing and begins to turn a shade of pink itself. Kothner’s doubling as the Nightwatchman, meanwhile, emphasises the hold the Masters have enjoyed over the populace, though his powerlessness to quell the riot suggests the people are already on the turn. Of the Masters themselves, only Sachs seems willing to accept and welcome Walther’s difference, though never going so far as to become coloured by it himself. At the end, he firmly asserts his ‘Habt acht!’ before realising that the cause is lost as, in the closing bars, the liberated Eva leads a peaceful revolution in which all – Masters and people – at last intermingle as one beneath a rosy glow. It would all seem rather simplistic an interpretation were it not carried out with such élan. Matthias Koch’s sets and costumes are integral to that success – in their simplicity and stylisation they pay homage to the austerity of Wieland Wagner, yet Jakubaschk’s direction ensures that characters aren’t reduced to automatons beneath the monochrome visuals. One particular coup comes during Sachs’s Wahn Monologue, when the set revolves to reveal a frozen tableau from the previous night’s riot, complete with Beckmesser in full scream while being throttled by David and everyone held in uncomfortable-looking ‘mid-air’ poses until the scene has disappeared from view. Apart from the riot, stage clutter is minimal – barely more than a last for Sachs’s cobbler’s workshop and a podium for the song contest – very much putting the onus on the singers and the music. While Wuppertal has recently had to lay off its house ensemble to save it from bankruptcy, Mainz’s still evidently thrives: Derrick Ballard’s Sachs and Alexander Spemann’s Walther were just two who were cast from within the resident company. Armin Kolarczyk’s Beckmesser, ‘borrowed’ from the Karlsruhe ensemble, was a scheduled replacement for a house singer at this performance and Mainz’s indisposed David was covered with remarkable assurance at short notice by Martin Koch from Oper Köln. In all, it was evidence of a marvellous company achievement, without a weak link in the cast, though one might have wished for more vocal heft from Spemann in riding the orchestra and, if being pernickety, Ballard could have brought greater warmth to his more lyrical moments. Kolarczyk played the hurdygurdy-wielding Beckmesser vocally and dramatically ‘straight’, rather than for laughs (he and Walther shook and made up amid the concluding celebrations of Act III), and Vida Mikneviciute made Eva a more assertive character than usual, mirrored in the bright vibrancy of her singing. Mainz’s chorus and orchestra did the company proud, and conductor Hermann Bäumer held everything together with the skill of a master himself. Two highly ‘interventionist’ approaches to staging Wagner, then, both of which succeed on their own terms, in their internal logic and in the insight they provide on the themes underlying the dramas. The composer’s detailed plotting may sometimes go out the window, but is it too far-fetched to suggest that he was more concerned with idea than story-telling specifics in any case? Better this approach than the kind of bland narrative that marked this summer’s Lohengrin at Theater Pforzheim, where Wolf Widder’s modern-dress production promised much (and was tremendously sung and played, with a slightly reduced orchestration) but lacked that crucial element of directorial interpretation that makes operatic theatre a living art form.